GraphQL bindings provide a convenient interface for interacting with a GraphQL API with your favorite programming language. Instead of sending queries as strings like we demonstrated above, you can invoke a binding function which constructs a GraphQL request and sends it to a GraphQL server for you. Bindings can be useful in combination with statically typed languages that IDEs and code editors to leverage tooling that can be configured in such a way that they validate GraphQL requests at compile time or even provide auto-completion for an advanced developer experience. 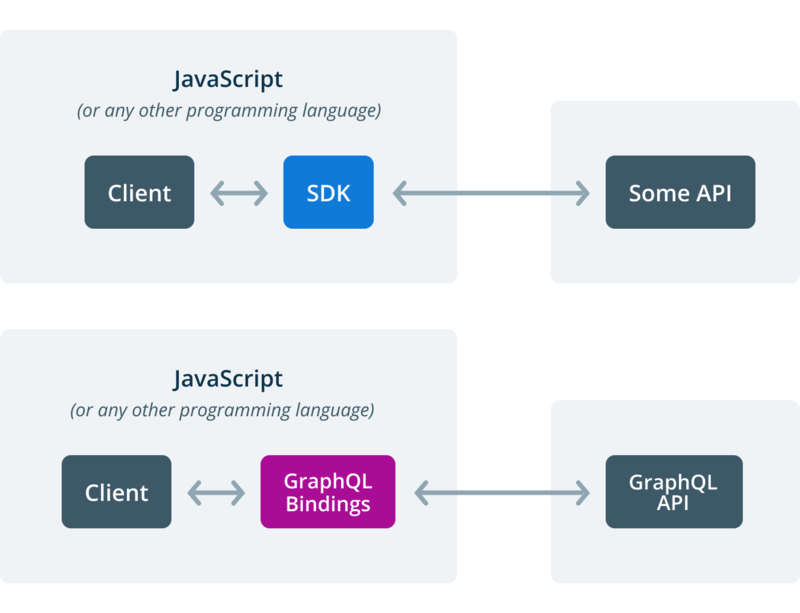 A perspective that onboards engineers is to think of GraphQL bindings as an auto-generated SDK for GraphQL APIs. You can find code for the graphql-binding-example here. Learn how to create your own GraphQL binding here. In the following, we&apos;ll discuss three scenarios illustrating how the example binding can be used. This time, no arguments are being passed and the selection set asks for the id and the name of the Users being returned. When responding to webhooks from 3rd party services, bindings are useful to access your GraphQL API to do specific work. For this example, consider an application which responds to webhooks from a service that has its own user accounts system. In this service, the system sends a HTTP POST whenever a new user is created and we want to add that user to our database. When building gateways for GraphQL-based microservices, bindings are especially helpful. In the previous example, we have demonstrated the API where the selection set for the constructed query is passed as a string. For this use case, the binding API allows to pass on the info argument of GraphQL resolvers. Now, when implementing the resolvers for this schema, you&apos;re going to delegate the queries to the underlying GraphQL microservice - using the binding instance from the &apos;graphql-binding-example&apos; package. Play around with the hosted playground to see the binding in action! For the user and createUserWithAllowedName resolvers, the binding will behave exactly like in the previous example and construct a GraphQL query/mutation to send to the API. The big difference to the previous example with the simple Node script is that now the selection set is not hardcoded any more. Instead, it is provided through the info object of the incoming query/mutation. The info object carries the abstract syntax tree (AST) of the incoming GraphQL query, meaning it knows the requested fields as well as any arguments and can simply pass them along to the underlying GraphQL API - this is called query delegation. To learn more about the infoobject, check out this deep-dive article into its structure as well as its role during the query resolution process.